The study which describes their findings – titled “Plausible home stars of the interstellar object ‘Oumuamua found in Gaia DR2” – was recently accepted for publication by the Astrophysical Journal. The study was led by Coryn Bailer-Jones of the Max Planck Institute for Astronomy and included members from NASA’s Jet Propulsion Laboratory, the ESA’s SSA-NEO Coordination Center, the European Southern Observatory (ESO), the Southwest Research Institute (SwRI), and multiple universities and research institutes. To backtrack ‘Oumaumua to where it began its interstellar journey (more than a million years ago), the team relied on the second release of data from the ESA’s Gaia satellite (Gaia DR2). While studies have been conducted in the past that sought to determine where ‘Oumaumua came from (one of which determined that it likely originated in a binary system), none were able to provide a plausible location. The reason for this had to do with assumptions made about ‘Oumuamua’s orbit within the Solar System, which was not simply the result of an object moving exclusively under the influence of the Sun’s gravity. As a 2018 study led by ESA astronomer Marco Micheli showed, ‘Oumuamua was experiencing an additional source of acceleration when it was close to the Sun. The most likely explanation was that ‘Oumuamua was experiencing outgassing, where frozen volatiles (i.e. water, carbon dioxide, methane, ammonia, etc.) sublimate as the object gets closer to the Sun. This behavior, which is consistent with comets, would have added a small amount of acceleration. 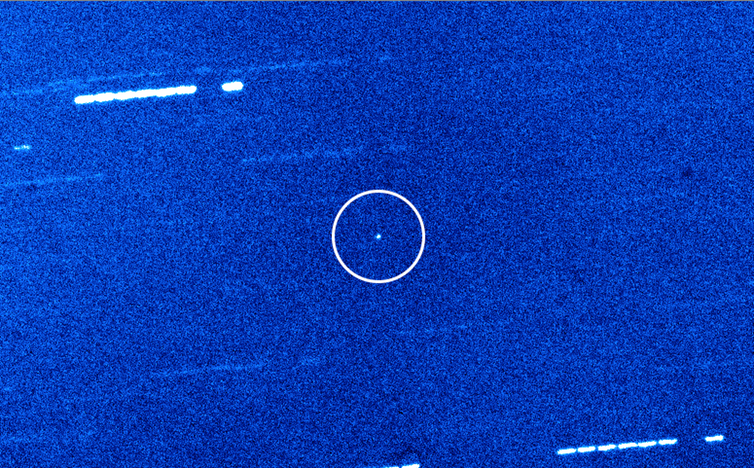 While it would have been too weak to be noticed initially, it was too strong to be ignored when back-tracking ‘Oumuamua orbit. By factoring this added acceleration into ‘Oumuamua’s pass through our Solar System, Bailer-Jones and his colleagues were able to obtain precise estimates of the direction and speed of the interstellar asteroid as it entered our Solar System. However, this was only part of the puzzle and the team also had to determine what ‘Oumuamua encountered along the way and how it might have altered the asteroid’s trajectory. To answer this, Bailer-Jones and his colleagues relied on data from Gaia’s DR2, which includes precise information about the distances, positions and motions for 1.3 billion stars. As the leader of one of the groups in charge of preparing Gaia data for use by the scientific community, Bailer-Jones was already intimately familiar with this particular data set. DR2 also includes information about the radial velocity (i.e. the star’s motion towards and away from us) for 7 million of these stars, which the team combined with astronomical data for an addition 220,000 stars using the Simbad database. The team then created a simplified scenario where both ‘Oumuamua and all the stars in the study moved along straight lines and at constant speeds. From this , they determined that there were 4500 stars that were likely to have experienced a close encounter with ‘Oumuamua as it traveled to our Solar System. The last step involved tracing the past motions of these stars and ‘Oumuamua using a smoothed-out version of the galactic potential (the gravitational influence of all matter in our galaxy). Previous studies have also suggested that ‘Oumuamua was ejected from its home star’s planetary system during the planet formation phase. These studies have also found that the relative speed of ‘Oumuamua and its home star was likely to be comparatively slow at the time. After taking these characteristics into account, Bailer-Jones and his colleagues narrowed ‘Oumuamua’s home system down to four stars. Of these stars, all of which are dwarf stars, two made the closest approaches to ‘Oumuamua. The first of these, HIP 3757, is reddish dwarf star that moved to within 1.96 lights years of ‘Oumuamua about one million years ago – the closest any of the four stars have come to the asteroid. However, the comparatively fast relative speed with which it approached ‘Oumuamua (~25 km/s) would seem to indicate that this is not where the asteroid came from. The other candidate, HD 292249, is similar to our Sun and approached ‘Oumuamua less closely about 3.8 million years ago. However, it did so at a slower relative speed of 10 km/s, which is more consistent with it being where the asteroid came from. The two other candidates approached ‘Oumuamua 1.1 and 6.3 million years ago, respectively, at intermediate speeds and distances. But of course, there are limitations to this study and much research is still needed before ‘Oumuamua’s origins can be known for certain. For starters, its home system would need to have a suitably large giant planet in order for ‘Oumuamua to have been ejected millions of years ago. No planets have been detected in these systems; but since they have yet to be surveyed, nothing can be said either way. Another issue is the number of radial velocities included in Gaia’s second data release, which is comparatively small. The third release, which is expected to take place in 2021, is expected to provide radial velocity data on ten times as many stars, which could result in more potential candidates. In short, the hunt for our Solar System’s first-discovered interstellar visitor continues!